Mary Jo picked up a new slow cooker a few months ago and we’d never used it. We can’t say that any more. 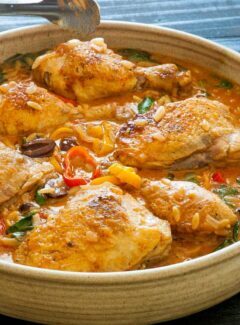 I made this wonderful slow cooker chicken with orzo and kalamata olives dish last Sunday. This is a recipe from our friendly Publix food market and it is spot on delicious. You should check out the Publix Web Site, for other recipe ideas. The recipe only requires hands on attention for about 25 minutes. The rest of the time your slow cooker does it’s job. We have a nice programmable Crockpot brand slow cooker which is a 4 quart model. They also make a similar 6 quart model. The prep time for this includes dicing a sweet onion, slicing up the peppers and halving some pitted kalamata olives. (I like halving pitted kalamatas because all the olives are pitted, except the ones that aren’t. I’ve been surprised more than once by the ones that aren’t). Next, all that’s required is to brown the chicken and soften the onion and sweet peppers. Throw everything into the slow cooker for 2 hours, then add the orzo and olives and let it cook for another 40 minutes and you pretty much have the finished meal. The chicken is falling off the bone moist and delicious. The accompanying orzo and vegetables have tremendous flavor. This is a dish that can’t miss and everyone from kids to adults are going to love it. 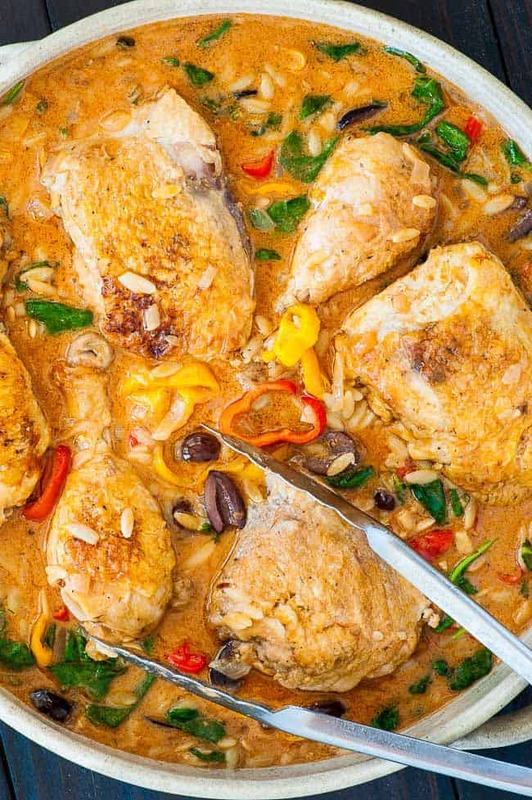 Slow cooker chicken with orzo and kalamata olives is a keeper recipe. This post contains an affiliate link which means Joe’s Healthy Meals will receive a small commission if you purchase anything through the link. Thank You! Delicious family style meal from Publix grocery, Aprons recipe with a few tweaks. Heat a large heavy skillet sprayed with cooking spray on medium high heat and place the chicken pieces skin side down until the skin is nicely brown, turn and repeat on the second side, 8 to 10 minutes. 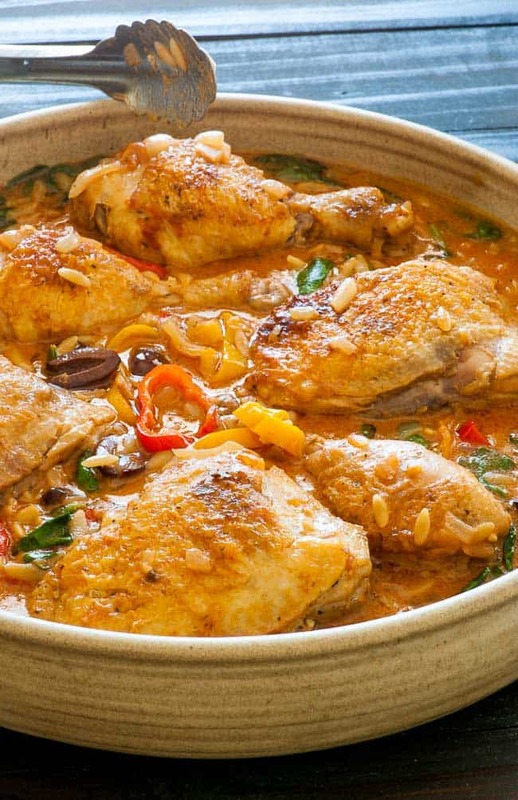 Place the browned chicken in a slow cooker. Using the same skillet, on medium heat, add the onion and peppers to soften, 5 minutes. Stir in the chicken broth, tomato sauce, yogurt dressing and the pepper flakes and bring to a boil then pour this over the chicken in the slow cooker. Cook on high heat for 2 hours. Next, add the orzo and kalamata olives, stir in and cook for 35 to 40 minutes more until the orzo is done. Remove the chicken parts and place on a large platter or shallow serving bowl, then stir in the spinach leaves to wilt, about 2 minutes. Pour the orzo/spinach/kalamata olive mixture into the serving dish with the chicken. 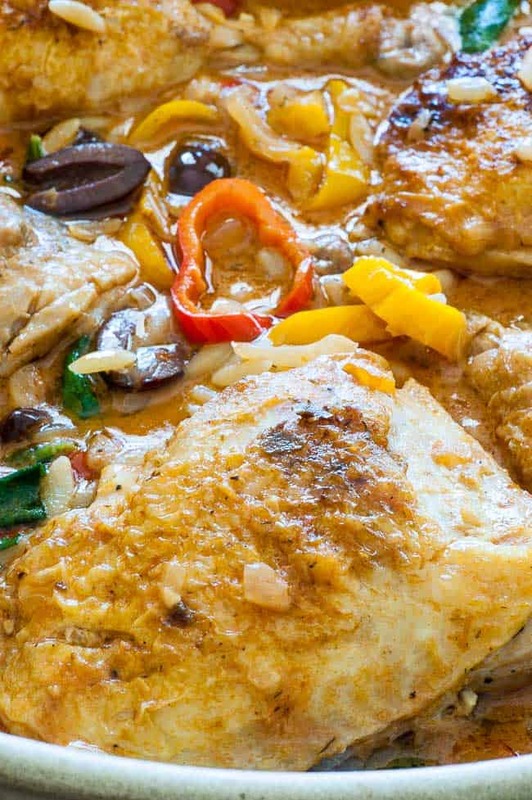 This has such wonderful flavor with tender chicken and a sauce that is way more than the sum of its parts! 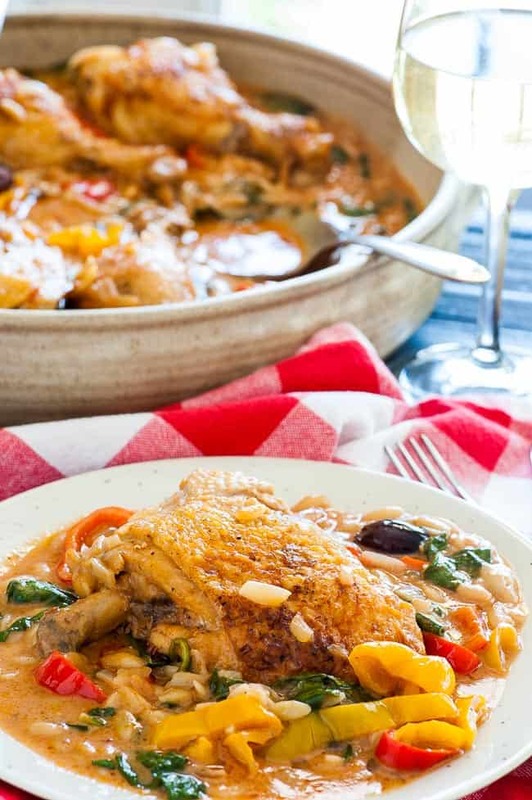 I’ll bet that you could make this by eliminating the browning of the chicken and vegies and just mixing everything together in the slow cooker–except the orzo and olives–then cooking it on low for a few hours, adding the orzo and olives as the recipe directs. I have to try this. Sounds wonderful!